Healthy, all natural salsa is hard to find - that's why we've decided to bring it right to your screen! This mango avocado salsa pairs great with organic tortilla chips as a quick snack or can be used as a delicious sauce on top of grilled seafood or meat! Impress your friends and family at your next summer gathering with this yummy + healthy salsa. 1. Prepare and chop/dice mango, avocado and tomatoes. Add to large bowl. 2. Add cilantro, garlic, red onion, lime juice, sea salt and olive oil to bowl. If desired, add habanero chili pepper to bowl. 3. Mix all ingredients well. Give this salsa a try + let us know your thoughts! Chickpeas, also known as Garbanzo beans, are an excellent source of protein, especially for vegetarians + vegans. As one of our favorite ingredients, this easy no-cook recipe is the perfect way to show it off. This Mediterranean inspired salad is ideal for a lunch on-the-go or a picnic with friends!! We are convinced this is the easiest salad to whip up - check it out! 1. Rinse and drain chickpeas and sweet corn thoroughly. 2. Wash spinach, cut cherry tomatoes, chop avocado. 3. Add spinach to large bowl, then add chickpeas, sweet corn, cherry tomatoes and avocado. Toss gently. 4. Wash and chop cilantro. Add to bowl. 5. Drizzle lemon juice on top if desired. Give this yummy salad a try + let us know what you think! Brussels Sprouts - how come they have such a bad rep? 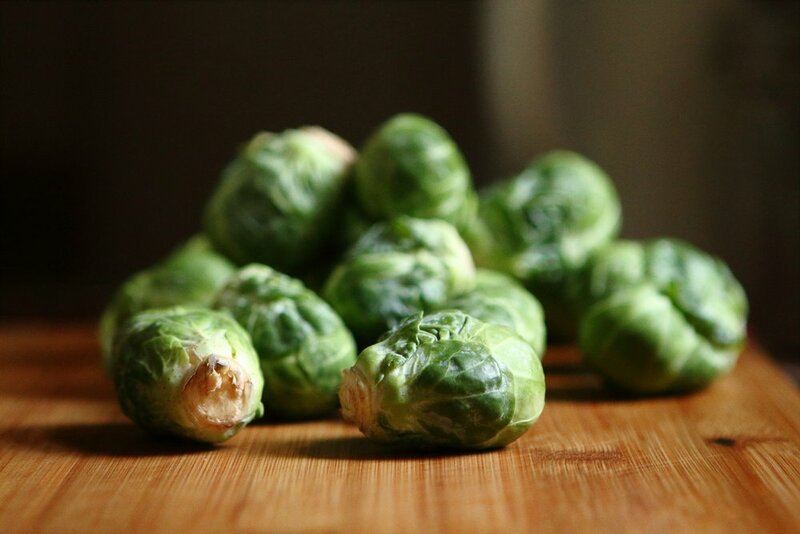 Not only are they tasty, Brussels Sprouts can help lower inflammation and are high in nutrients such as fiber and Vitamin K.
This fun + easy recipe can be made for a quick, healthy snack or can be meal prepped for your busy week ahead! Give these Roasted Brussels Sprouts a try + let us know what you think! 1. Rinse all Brussels Sprouts thoroughly. 2. Trim and cut sprouts in half - try to keep the size as consistent as possible to ensure they roast evenly! 3. Preheat oven to 425F. 4. Add Brussels Sprouts and olive oil to large zip close bag. Close thoroughly. Shake to mix and coat. 5. Add garlic sea salt, black pepper and turmeric to the bag. Close thoroughly. Shake to mix and coat. 6. Add seasoned Brussels Sprouts to baking pan. Spread evenly. 7. Bake at 425°F for 20 minutes or until sprouts are lightly browned. 6. Let cool + enjoy! Go ahead and give these a try! Looking to switch up your morning breakfast routine? We've got a new + easy recipe for you! Not only are these egg cups easy to make, they also are a great source of veggies + protein for a complete breakfast. Meal prep these ahead of time, refrigerate them, and heat + serve when ready! Give them a try + let us know what you think in the comments! 1. Grease muffin tin with preferred ingredient and preheat oven to 350°F. 2. Whisk eggs and egg whites together in large bowl. 3. Add spinach, peppers, and cheese to mixture. 4. Fill ~9 muffin cups about 3/4 of the way. 5. Bake at 350°F for 20-25 minute or until eggs are set and no longer runny. 6. Enjoy right away or refrigerate + save for later! This green smoothie made with fresh ingredients is a great way to cool off during these hot, summer months. Try it out + let us know what you think! 1. Add kale, celery and water to blender. Blend well. 2. Add apple, cucumber and lemon juice to blender. Blend well. Drink straight away + enjoy!